Our Forensics: Anatomy of Crime exhibition closes on 21 June 2015. The show is split into five sections, one of which is “the morgue”. The modern morgue, or mortuary, was established as a dedicated building in the 19th century. Taryn Cain tells us about La Morgue, an unlikely public attraction in 1800s Paris. If you were visiting Paris today, you’d probably find yourself walking past the Love Padlocks on the Pont des Arts, walking through Notre Dame and a mile on from there you’d be at the Louvre. If you were in Paris in the 1880s, there would be an altogether different attraction that you would almost certainly have found yourself in. The “only free theatre in Paris”, otherwise known as the La Morgue. 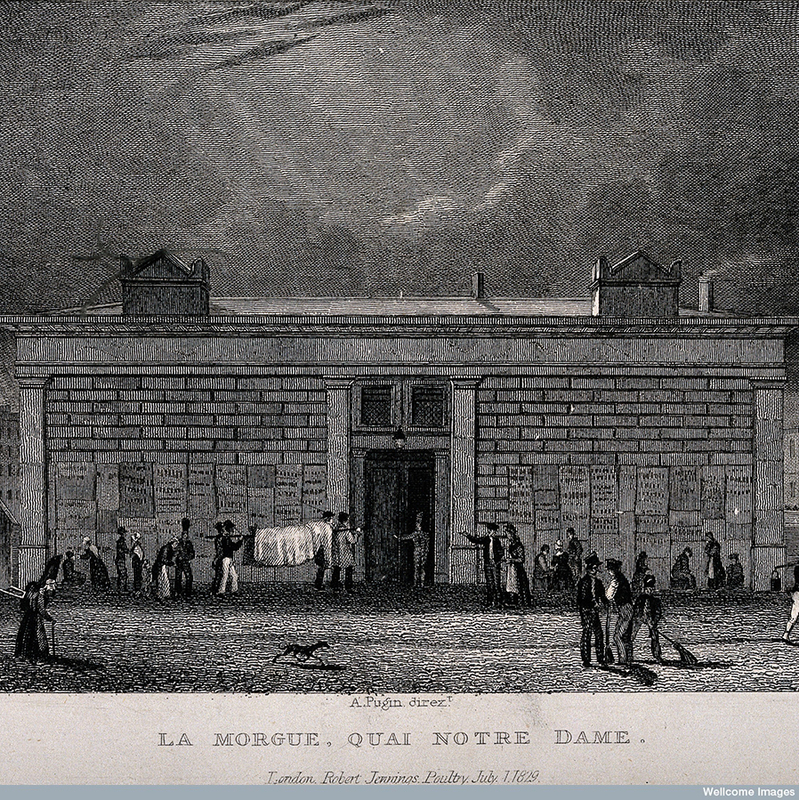 The morgue first opened its doors to the public in 1804 on Ile de la Cite, before moving to a new and larger building behind Notre Dame in 1864, where a memorial now sits. The location of the morgue was no accident: being in the epicentre of Paris and right next to the Seine, the morgue was in a good position to receive both the dead and the living. Many of the bodies, which were picked up off the streets or fished out of the Seine, were unidentifiable, so the public were ostensibly allowed in to help with their identification. Street vendors on the Seine in Paris. At the time, Paris was changing; it was becoming a more social, less divided city. Sigmund Freud described it in 1885 as a place where, “I don’t think they know the meaning of shame or fear; the women no less than the men crowd round nudities as much as they do round corpses in the morgue”. People of all ages and classes were beginning to socialise on the streets of Paris and in its local attractions. The morgue became one of the places to see and be seen and, since the morgue was open seven days a week, from dawn to 6pm, many Parisian residents became regular visitors right along with the tourists. People visiting the morgue in Paris to view the cadavers. When arriving at the morgue, the bodies were first stripped, inspected, frozen and then wheeled out on black marble slabs for public display. As the morgue was not refrigerated until 1882, cold water would drip from the ceiling constantly, giving the skin of the dead a bloated and puffy appearance. Up to 50 visitors at a time would crowd around great windows overlooking the slabs, to gawk and gossip over the bodies. The dead would usually have to be removed after 3 days due to decomposition, at which point a photograph or a wax cast would take their place. A crowd gathers to view the grisly sight of the bodies. The spectacle continued beyond the walls of the morgue. Parisian newspapers often speculated on the identities of the dead; every guide book directed visitors to the morgue; and some of the bodies became famous, drawing up to 40,000 people in a day. 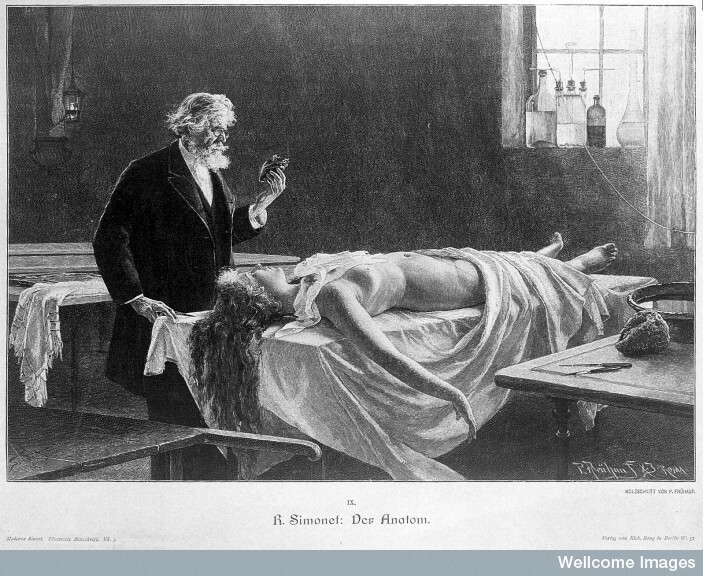 Deceased young women lying naked on dissection tables became a common theme on canvas and the police would even stage public “confrontations” between a suspected murderer and a corpse, drawing much of the intrigue that reality programs do today. The most famous corpse to come out of the Paris morgue may not have even been dead at all. L’inconnue de la Seine was a woman who was reportedly fished out of the Seine in the 1880s after a successful suicide attempt. Arriving at the morgue with a “Mona Lisa” smile on her face, an assistant was so taken with her beauty that a cast was taken of her face. Rather than drift into obscurity, that cast spurred a fascination which peaked in the 1920s and ’30s. 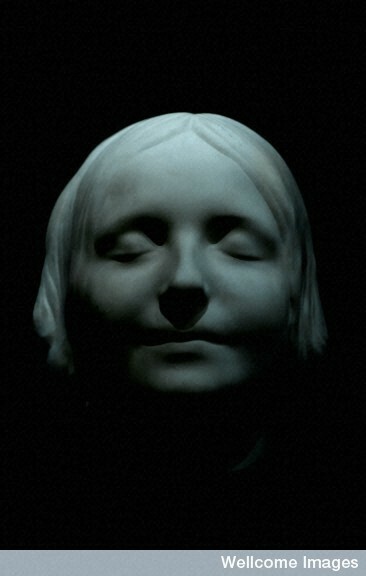 Many households contained the death mask of the L’inconnue de la Seine and many literary works were inspired by her story. Despite her origins being unknown, she was rumoured to come from Germany, Russia and even the UK before meeting her end in Paris. In the 1960s her allure continued when she inspired the face of the first CPR dummy, Resusci Anne. In recent years much doubt has been cast on the story of L’inconnue de la Seine, particularly by people who work with the dead. It is now believed the original cast was taken from a living woman. The morgue was finally closed to the public in 1907 over moral concerns, drawing complaints from local businesses, street vendors and journalists. We may look back and wonder how the people of Paris could look upon the swollen and degraded bodies of their fellow man and not be affected, only to remember that death was much closer to them than it is to us. People were still being executed in public until 1939, pneumonia and the flu were still a common cause of death, infant mortality was high and most people died at home. As medical science improved, people of all ages began surviving at greater numbers and death slowly disappeared from view into hospitals and hospices. That’s not to say that we today don’t have our own attraction to death. The Body Worlds exhibit took the world by storm when it debuted in Tokyo in 1995. The odourless and plastinated cadavers which travelled throughout Asia, Europe and America may have been sanitised in comparison to the 19th century dead, but the visitors were just as keen to see them. 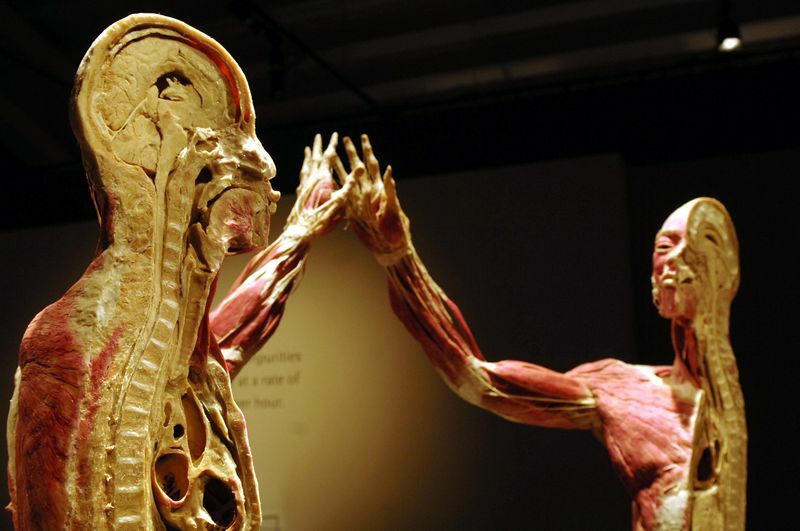 Body Worlds exhibition (image credit: Premier Exhibitons). Like the Paris Morgue, Body Worlds exhibits were accused of immorality, desacralisation of the dead and of treating death as a spectacle. As a result of the controversy, different legislation was passed around the world regarding the use of human remains, with the legislation in the UK known as the Human Tissue Act 2004. Yet despite all these charges, our fascination continues, with over 40 million visitors to the Body Worlds exhibits alone. Taryn is a Visitor Experience Assistant at Wellcome Collection. For further reading on the morgue as visitor attraction, see Vanessa Schwartz’s excellent book Spectacular Realities: Early Mass Culture in fine-de-siècle Paris in the reading area in our Medicine Man gallery.